The Stunt Dog Guy TM | As seen on Oprah Winfrey, Ellen Degeneres, Tonight Show with Jay Leno, and Pet Stars with Mario Lopez. We are proud to announce that our first dog training book is now available, the “Big Book of Tricks for the Best Dog Ever” is authored by star trainer Chris Perondi and best selling author Larry Kay (@PositivelyWoof / Training the Best Dog Ever). A Step-by-Step guide to 118 amazing stunts and tricks. Use the power of positive reinforcement to have fun together and strengthen the bond between you and your dog. This book is perfect for puppies and adult dogs. You can train a dog at any age, it doesn’t matter the breed or size. Using the secrets of professional dog trainers (Chris & Suhey Perondi), this fully illustrated guide with hundreds of step-by-step photos shows how to teach your dog 118 tricks and stunts. Organized from beginner level to pro, these tricks run the gamut from the kinds of things any well-behaved dog should know-fetch, paw shake, roll over-to stunts that will delight your friends and family, from dance routines to flying disc acrobatics. You’ll even learn to create your own movie dog magic and performance showstoppers. And there are benefits far beyond the wow factor. Teaching your dogs tricks will not only reveal more of your dog’s real personality, including hidden talents, it will also improve your pet’s behavior, reinforce socialization, prevent boredom and restlessness, and instill your pet with greater confidence. And dramatically enrich the relationship the two of you already share. You can order our book direct from us here. What is a “Stunt Dog”? Defined by Chris Perondi, The Stunt Dog Guy. I am often asked what the difference is between a dog trick and a dog stunt? And what makes a dog who performs stunts into a stunt dog? Here are my thoughts. Let me know yours! What is a Stunt Dog? 1. a dog who performs unique, difficult, or spectacular feats requiring great skill, unusual strength, acrobatics, or dexterity; especially during a live performance, or for a TV show or movie, or to gain attention or publicity. 2. a dog who performs a “daring behavior” that requires extensive training and conditioning, and which is typically performed with intention to wow an audience. 3. a dog who is trained to execute complex skills and multiple chained behaviors reliably and on cue for a live audience or recorded show. 4. A dog who performs any of the above from a distance, or with an actor who is not the trainer or handler, and typically during a live performance or recorded show. I am also often asked to DEFINE a stunt dog live PERFORMANCE. Here are my thoughts. Please share yours! “A stunt dog live performance” is a professional, non-demonstrational act for entertainment purposes with a unique, high-energy and entertaining format, having a written script, and including a professional presenter or emcee. In our shows, the “Stunt Dog Experience” and the “All-Star Stunt Dog Show” (stuntdogshow.com) the “Stunt Dogs” perform acrobatic moves, dog sports, and advanced behaviors that include backflips, jumping rope, walking hand stands, behaviors from a distance, the use of props such as a tight rope, barrel, balance ball, riding a bicyle, or skateboard. Our live performances also include daring feats such as vaults (whereby a dog may jump off a trainer’s back to catch a flying disc), circus acrobatics, and highly-trained balancing skills. REMEMBER: Dog stunts always require extensive dog training and conditioning. Always train safely and never force or lure your dog to do anything that he or she doesn’t want to do. OUR NEW BOOK on Dog Tricks and Stunts will be published early next year by Workman Publishing with my best-selling and award-winning coauthor Larry Kay of PositivelyWoof.com . Stay tuned for details on pre-ordering! They say that a dog is man’s best friend and the two certainly seem to share a long and illustrious history of co-evolution but did you know there are a number of health benefits that come from owning a pet dog? Research suggests that the strong connection between man and dog comes from the mutual release of oxytocin upon interaction. This hormone is responsible for fostering strong feelings of love in the brain and is usually associated with the bonding process between newborn babies and their mothers. But what else does this mean for mental and physical wellbeing? Having a dog around from an early age means your immunity will get a boost. Over-sanitizing our homes is actually making us less resistant to germs and in turn we get sicker, quicker. A dog – notorious for carrying germs – can help build your immunity. They can also enhance your resilience to allergies. Studies show that dog owners are less likely to suffer from depression and anxiety than those without a pet. This is partly down to the release of oxytocin and serotonin (another feel-good brain chemical) that comes from interaction and coevolution with the dog. However, the routine associated with a dog such as caring for them and taking them for walks is thought to improve a depressive episode even for those who suffer from clinical depression. Animal therapy is often used in rehabilitation programs because the presence of a dog is so calming and the act of bonding and caring for them is known to improve self-esteem. Dog owners have also been proven to have lower stress levels (and consequently lower blood pressure) than those without a dog. This is great for cardiovascular health. In addition to this, dog owners are more likely to undertake regular exercise which is also good for keeping cholesterol down and reducing the risk of obesity – this is great for heart health and indeed general health. There have been numerous case studies over the past two decades that seem to imply that dogs can sniff out cancer. These often involve incidents where dog owners have reported their animals continually sniffing at a lump, mole or part of the body that has later been proven to be cancerous. It is unclear whether or not the dog’s sensitive sense of smell is able to detect cancer cells in bodily fluids but, regardless, this could be one animal that may save your life one day. This dog can fly! Meet our All-Star Stunt Dog “Storm Shadow”. She is a 3-year old mutt that is mixed between Australian Kelpie and Cattle Dog. She is nuts for her favorite Aerobie brand flying discs (aka Frisbees) Weighing in at only about 25 lbs she can certainly soar! Chris Perondi’s “Stunt Dog Adventure”TM is the most educational and entertaining show of it’s kind! Featuring talented rescued dogs that show off their prey drive, intelligence, and athleticism. Every show includes a message of pet adoption and responsible pet ownership, while using positive training methods. Every show script is professionally written and includes educational talking points about the similarities of domestic dogs and their wild cousins: foxes, jackals, wolves, and coyotes. The “Stunt Dog Adventure”TM show is also very entertaining with segments like the “Prey Drive Challenge”, high-jumping, flying disc, and audience participation. You won’t want to miss these domesticated canine stars in the world’s most exciting Zoo and wildlife park program. The footage from this video was taken during our March through October Indianapolis Zoo production of 2015. It showcases the talents of the animal that has been coined in history as our best friend! Starring professional dog trainers Chris Perondi, Suhey Perondi, and Abby Cline. Stunt Dog Productions is honored to have their stunt dogs featured on NatGeo Wild’s “World’s Greatest Dogs” this weekend! (Check your local listing for exact air times). So it’s now official, our dogs are considered some of the world’s greatest dogs! Stunt Dog Crazy Confetti was chosen for her unique talents and touching back story. She has been a feature star in the Perondi’s show since 2010. Confetti is known best for her 360 degree “paw-stand” in the palm of trainer Chris Perondi’s hand. However, she can dazzle the crowd with impressive back-flips, jumping rope, hoops through the arms, flying disc catching stunts, skateboarding, triathlon racing, balancing feats and backing up on cue. The filming took place during the winter months when the Perondi’s were not on tour. So for this feature they invited all their friends and family over for a private show to try out some of Confetti’s new stunts and tricks. Many family members showed up including Chris’s parents and cousins, Suhey’s sister, along with their pastor, neighbors, and close friends. It was a memorable day for everyone. The Perondi’s had the pleasure of working with Indigo Films on this feature project. The interviews were conducted inside the Perondi’s house, outside on the property, and even inside their 43 ft. touring RV/bus. During the same week, the USA TODAY has also dedicated a special edition issue that all about dogs. The Perondi’s are proud to have a feature spread in this issue with multiple images of Crazy Confetti in action. Pick your copy up at your local newsstand from now until May 26th or purchase your copy online here: USA TODAY’S SPECIAL “DOGS” EDITION. 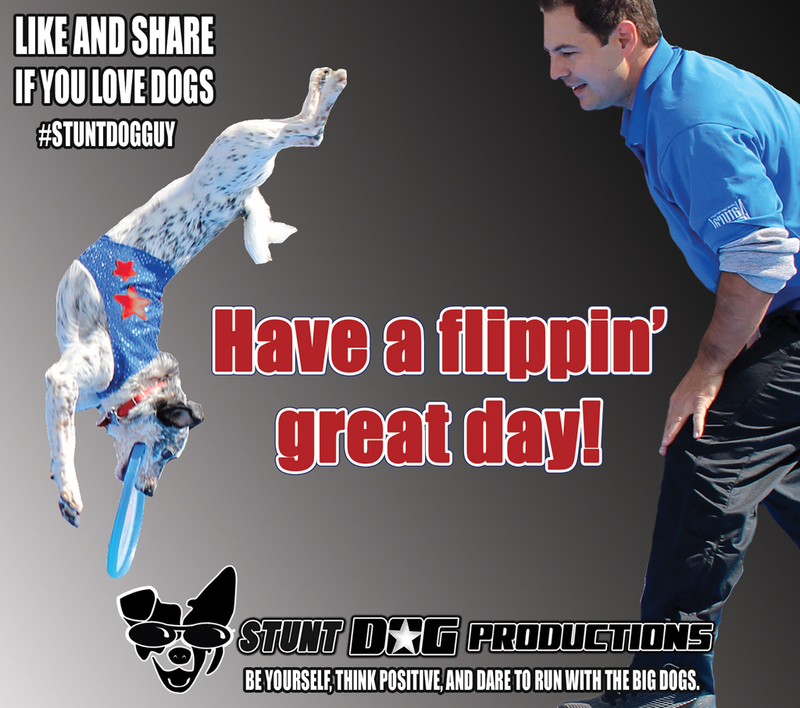 Have a flippin’ great day!